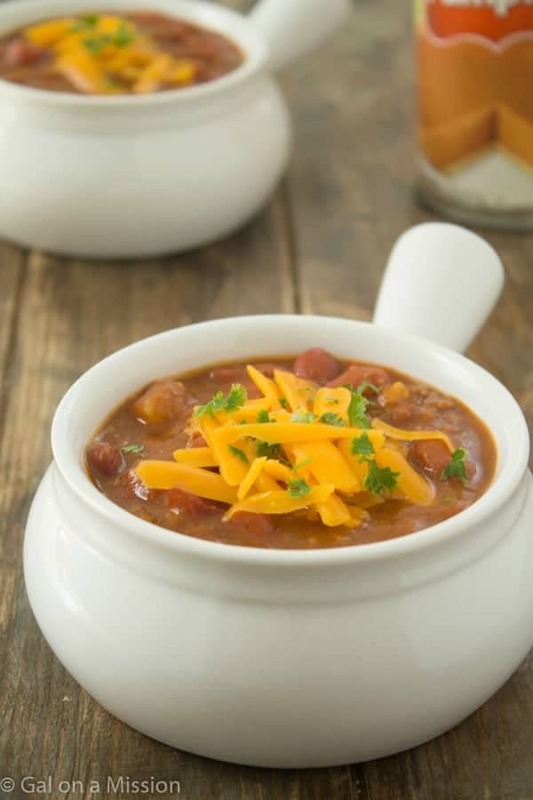 An easy pumpkin chili recipe that is hardy, delicious, and pure comfort food! A fall staple! I am a huge fan of chili in the fall and even in the winter. It always warms you up inside and outside, plus you can enjoy a delicious meal. 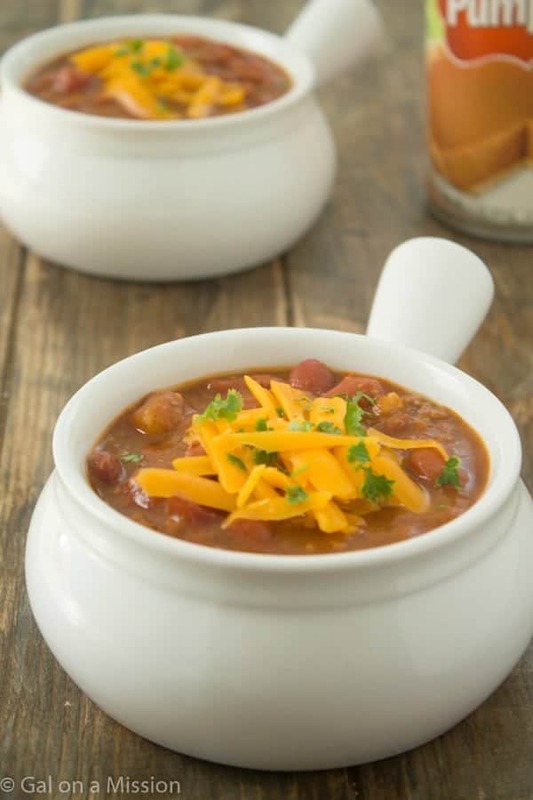 Definitely a staple in our home, especially this pumpkin chili. Yum! I am also another huge fan of chili because it allows you cut down on the meat and add in extra veggies and it can still be very hearty. A little bowl goes a long way. Wouldn’t you say so? So far I have shared pumpkin pie spice mix, white chocolate chip pumpkin cookies, and these this chili! I would say it’s been a great in my house and it still smells heavenly. What are some of you favorite pumpkin treats that you love? I love any sweet and savory pumpkin recipes. Right now I am going a little more towards to savory because I am trying to cut down on the sweets. It’s going to be super hard, especially with all of the holidays right around the corner. If you have already made a batch of the pumpkin pie spice mix, that’s great! You will need it for this recipe. 🙂 When I am making a batch of chili, I like to cook it in my slow cooker or allow it to cool for half a day on the stove. It really allows all of the flavors to come together. If you only have 30 minutes, then you can still make it within that time-frame. Saute the minced garlic, onion, and green pepper in a large pot with oil. Cook until the onions are done. Add in the ground beef and cook until the ground beef is cooked through, about 10 minutes. Mix in the pumpkin ale or beef stock and allow it to simmer on low-to-medium heat for another 10 minutes. Mix in the pumpkin puree, red kidney beans, diced tomatoes, pumpkin pie spice mix, dark chili powder, and cumin. Allow the chili to look on low-heat for a couple of hours. Can also be done in the slow cooker on low for 8 hours or high for 4 hours. Serve with cheese, sour cream, or any of your favorite toppings. 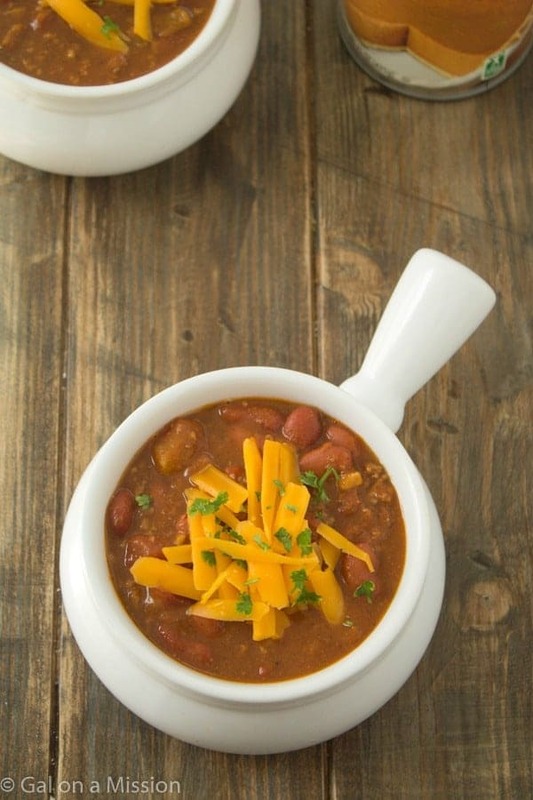 Pumpkin Chili’s so perfect for fall! Love it!